Ego term papers examine the second part of Sigmund Freud’s classic division of human personality. Below is a sample introduction of a research paper on the Ego. Paper Master's writers will compose a custom project that follows your specific guidelines. The ego is the second part of Sigmund Freud’s classic division of human personality. Along with the id and the superego, the ego grounds the individual in reality, attempting to achieve the wants of the id in a balanced way that avoids pain. Human consciousness, according to Freud, resides in the ego. The concept of ego has been discussed by psychological theorists since the time of Freud. Since his structural theory involving id, ego and super-ego, his students and other theorists have worked to explain not only the concept of ego, but also how it develops in the human psyche. Jung’s concept of collective unconscious and Erikson’s theory of psychosocial development both described ego development as a healthy event in a child’s early experience. Loevinger suggested that influence of family setting was crucial to ego development, and proposed stages of development that continue to be used by researchers for practical studies. Ego development continues to be studied while researchers include environmental and cultural factors in their theories. Perhaps futures studies will provide therapists with clear guidelines regarding behaviors that indicate poor ego development so that patients can be assisted in reaching their potential. The ego is the part of human personality that allows the individual to sort through information. Reason and common sense are housed in the ego, as opposed to the passions which live in the id. The ego seeks to keep the various aspects of the human personality in check, restraining the impulses of the id so as to allow decision making to proceed without dire consequences. Freud also stated that human defense mechanisms were part of the ego. Defense mechanisms are a reaction to the feelings of guilt and anxiety raised by the superego. Freud believed that the ego was halfway between the preconscious and the unconscious human mind. The word “ego” may be used to describe someone with an over-inflated sense of self, as in, “He has a big ego.” It may be conceptualized as similar to self-esteem. Images of Freud may come to mind, as he is commonly credited with first using the term. In truth, ego has a long history in the field of psychology. Many experts on the subject of ego have theorized about its development in the human mind. Do babies have a sense of ego? If not, how does it develop in early childhood? And what are the psychological consequences for poor ego development? This paper will explore these questions and explain how various theorists have attempted to answer them. The study of ego development will be explored in a chronological manner, however first the term will be more adequately defined. Then, theorists including Freud, ego psychologists, Jung, Erikson and Loevinger will be discussed along with related studies that support their work. Ego, as a psychological construct, is difficult to define. However, it is most often described as a part of the self that is connected externally. The ego is maintained through cognitive processes, including thinking, perceiving, remembering, reasoning, and attending. The extent to which people use these functions to defend their self-concepts indicates the relative strength or weakness of their ego. A more Jungian definition of ego is “a complex within the psyche which constitutes the center of a person’s field of consciousness and which appears to possess a high degree of continuity and identity”. Most theorist conceptualize ego as a part of the self that interacts with the world. The first modern theory of ego development is credited to Sigmund Freud. However, historians argue that Freud’s concepts originated in ancient Middle Eastern traditions. Freud would have been aware of these through his knowledge of Jewish cultural heritage. Additionally, components of his theory are similar to philosophical principles of ancient European civilization. Those principles continued to influence the culture in which Freud was raised because Austria and Germany were in transition during Freud’s formative years. Freud proposed that all behavior is essentially social manifestations of infantile instincts. These instincts are either sexual or aggressive. 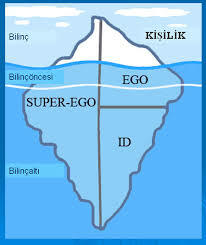 The psyche consists of the id, the ego and the super-ego. The id is purely instinct, or libido. The super-ego is the conscience or internalized parent. The ego is the rational intellect that balances the id and the super-ego. Freud believed that healthy men reconcile their id with their ego and abandon infantile issues. Experts on psychological development argue that Freud’s theory ignores the factor of free will in both individual and societal behavior. Freud’s theory has been characterized as both deterministic and mechanic. Jacob (1993) noted that according to Freud, “man is a prisoner of his lower unconscious and therefore deprived of a capacity for ethical behavior”. From Freud’s basic structural theory about ego a school of thought was created, known as ego, or structural, psychology. Ego psychologists studied the behavioral mode of defense and disguise, and how the ego affected character, cognition, affect and behavior. They believed that ego developed from unconscious conflicts. Ego development occurred in the context of caregivers, including that of a primary caregiver. Infants depend on the love, care and communication with a mother figure in order to develop a healthy ego. Development could be altered or arrested if an infant’s relationship with the primary caregiver was not formed or was broken. This could lead to psychic dissolution or even death. During early childhood, autonomous ego functions such as perception, motility, memory, language, symbolism and awareness of reality would all occur in the development sequence of the ego. Studies that support ego psychology concepts include those conducted by Jacobson in 1964. She found that representations of the self and objects shifted from a fused, undifferentiated matrix in infancy to defined separations between ego and environment in toddlerhood. She also proposed that psychosis was characterized by regression of self and objects representations. In 1975, Mahler theorized that although infants may be pre-adapted to separate themselves from non-self beings, they were not equipped to form a stable personal identity. She believed that infants progressed through stages of separation and individuation between six months to two years of age. Much like meta-psychology, ego psychology became less popular as researchers turned toward studies of measurable constructs. Today’s structural theorists take into account genetic, developmental and environmental considerations. Modern society has taken the term ego to represent a person’s self-esteem. Frequently, this has negative connotations, when individuals are said to have large egos or egos that bruise easily. The term “egomaniac” has come to represent an individual with an exaggerated sense of self. Psychoanalysis is a school of psychology that originated in the theory and research of Sigmund Freud (1856-1939). Order a research paper on psychoanalysis from Paper Masters. Eros and Thanatos research papers discuss Sigmund Freud's theory that human beings have an instinct for life which he called Eros, and an opposing drive Thanatos. Freud - Sigmund Freud created his theory on personality with several new key concepts still used today. The Oedipal Phase, also known as the oedipal period, occurs as a subset of Freud’s phallic stage, during which a child’s genitalia become the primary erogenous zone. Carl Jung Theories research papers discuss his theories on the 'balancing act' of the human psyche. Paper Masters writes custom research papers on Ego and examine the second part of Sigmund Freud’s classic division of human personality.